Government backlinks can put your magic website at the top of page one for Internet searches. That means you can be in position one or two! This eBook gives you the power to dominate Google. It does not take a rocket scientist to realize that the higher up the page you rank, the more calls and business you will get. You really need to be in the top four positions of the organic search results. Studies have shown that organic search results get more click-throughs than paid AdWords. I cover this more in my book, How To Rank On Goggle In 24 Hours . The secret is how to achieve those top three positions and that can be accomplished with Gov backlinks. This book fulfills a long awaited need for magicians and is Devin's latest in his magic marketing series. If you have a government or educational website linking to your website, this will often put you on page one of search engines. That is because they are hard to get and few people know how to do it for magic web sites and other entertainment sites. If your website has a link from a government site, then Google considers that your site must be worthwhile and important. In many cases Google will put you on page one. In this eBook, Devin will take you step by step and show you how to get government backlinks that page rank from PR6 to PR9 and these are DOFOLLOW links that will sky rocket your website above the competition. Most of these techniques do not require you to know SEO. Devin will show you ways that are very simple to some ways that are more complex. He guarantees, if you follow the simple steps in this book, you will have both government and educational backlinks within a matter of days! As a bonus, he will show you the changes you need to make or have your webmaster make to make sure you are in compliance with the last Google Panda and Penguin updates. This is information you need to know to keep your website on page one. This is information that will give you more GOV and EDU backlinks to your website than you dreamed possible and these techniques are all white hat and work. 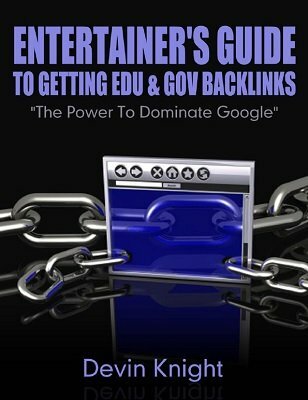 He will show you proof in the book showing actual government backlinks to his website that he got using these techniques. Although written for entertainers, the information in this book can help get any business on page one.